It has a been long while since I last updated the Canaries in the Coal Mine, a semi-regular piece which has a very long-term focus on the health of the bull market. 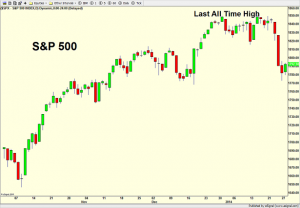 The analysis is only relevant at or near new bull market highs as I look for divergences in the major stock market indices, sectors and two other indicators. While helpful, it does not insulate bull markets from corrections; it just says that the final high hasn’t been made yet. 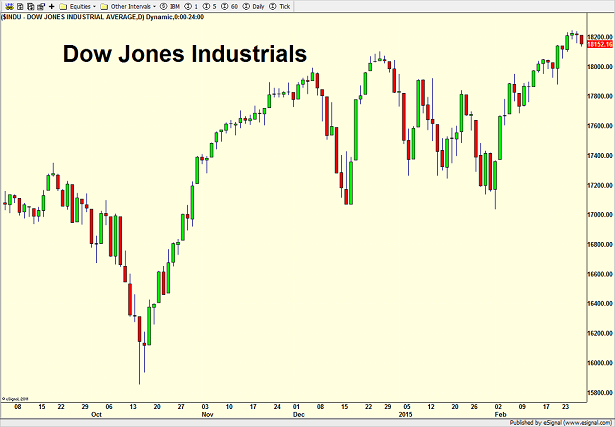 Let’s begin with the five major stock market indices. 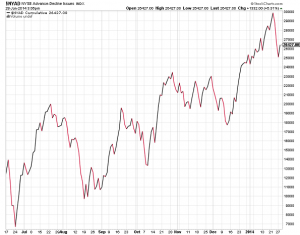 We are looking for warning signs that new highs are not being made by the majority. It is okay that they all don’t have the same behavioral pattern, but we want to see them march in the same direction. The Dow is first and you can see the last all-time high was made in early March of 2017. The S&P 500 (large cap) is next and it pretty much mirrors the Dow with its last high in March. 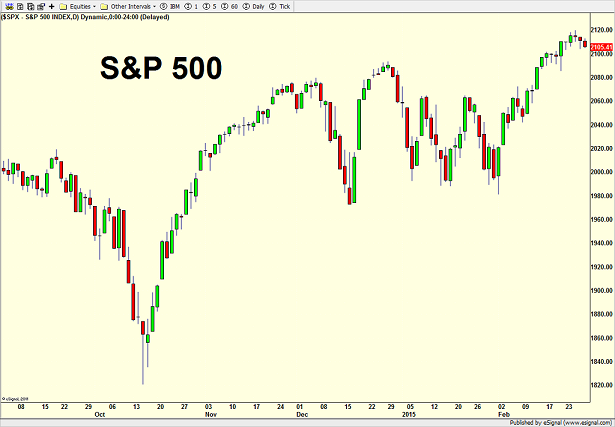 The S&P 400 (mid cap) is below and just like the previous two indices, the early March peak was seen. 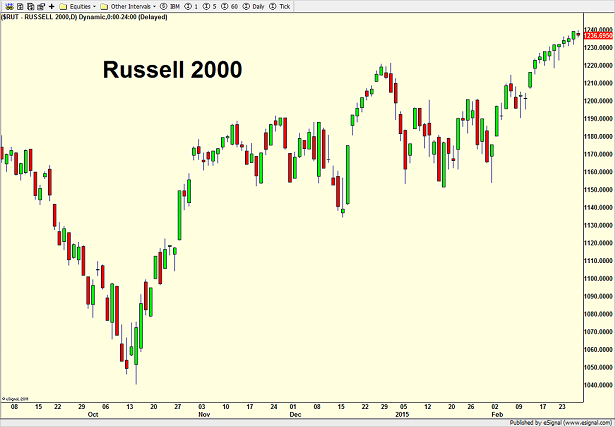 The Russell 2000 (small Cap) is below and while it looks a bit weaker than the first few indices, its last high was in line, early March. 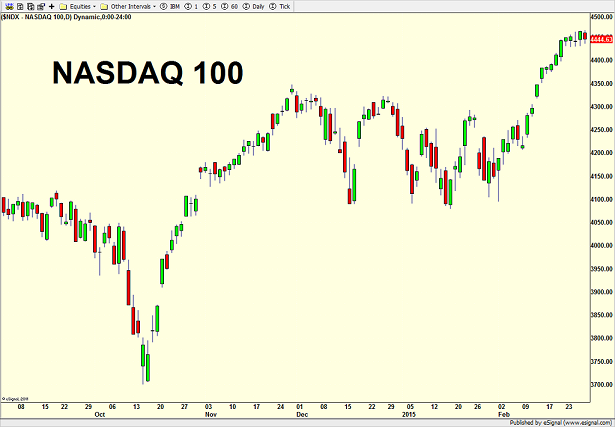 Finally, the NASDAQ 100 (tech) shows a much stronger pattern, having just made its all-time high. That’s not a warning sign as we have the lone outlier being stronger than the rest, not weaker. The canaries are definitely all alive and healthy in the major stock market indices. Is it Crash Helmet Time??? For the past three weeks, my message has been one of a little short-term concern against the backdrop of much higher prices to follow. That remains unchanged. Market sentiment had become frothy, meaning that too many people had become too confident in the stock market. We saw that in both the individual investor and newsletter writer sentiment surveys. Options traders were betting overwhelmingly on higher prices over the short-term. Corporate insiders were selling much more than they were buying. 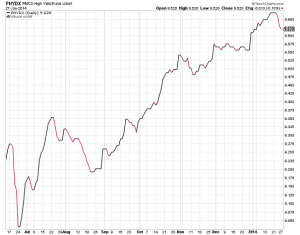 Traders using the Rydex mutual funds had become heavily invested on the “risk on” side. The short-term trading or ARMS index showed excessive buying pressure. 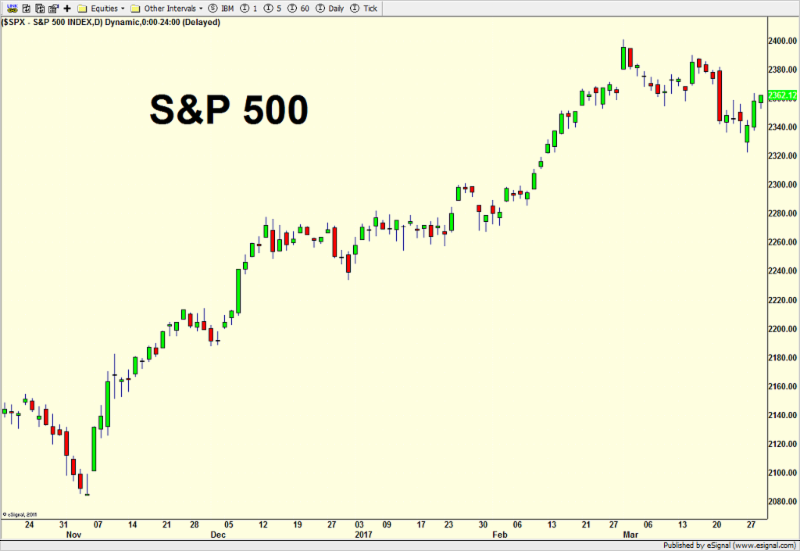 Combined together, we had stock market sentiment at potentially bull market killing levels. However, excessively bullish sentiment has never single handedly killed a bull market. There needs to be a poor monetary and/or valuation landscape as well, which we do not have today. So let’s not even begin the discussion about the bull market being over. I know I am beginning to play with fire as I have said that during every single pullback since 2012 began, but I continue to feel the same way today. Anyway, the pullback is here. It looks and feels nasty. The bears are coming out of the woodwork calling for a bear market, a 20% decline, even the 10% correction. As always, I could be wrong, but I view this bout of weakness as yet another single digit pullback that can be bought and will lead to fresh all-time highs next quarter. Yes, sentiment was really bad, but go back and reread my two pieces on Canaries in the Coal Mine. The big picture did not look unhealthy a few weeks ago and certainly does not today. 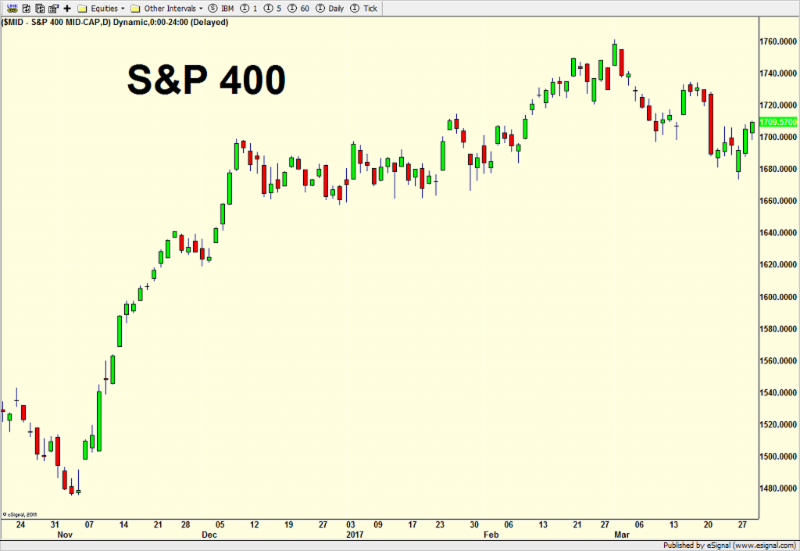 The market was due for some cleansing and the job is getting done now. Stocks should begin to probe for a low shortly between current levels and 4% lower. Technical damage has been relatively mild so far and it’s time to make our shopping list. 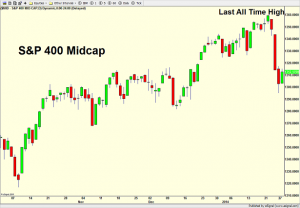 With the major stock market indices all in good shape beyond the short-term pullback, let’s take a look at the key sectors and two other important canaries. 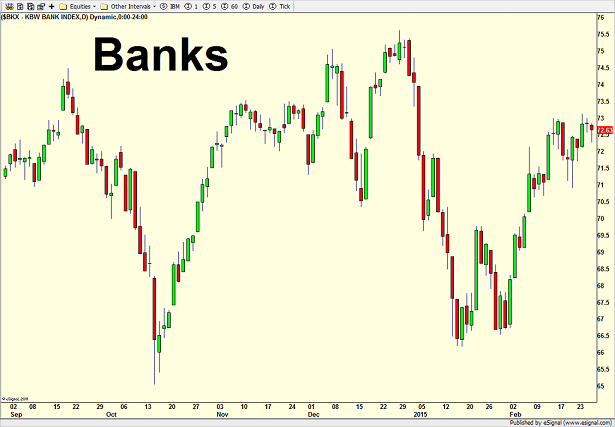 The banks are first and they remain mired in a trading range for the past year. Before the last bear market, banks peaked a good nine months before the major indices did. In the Dotcom bear market, banks topped a full 18 months before the overall market did. 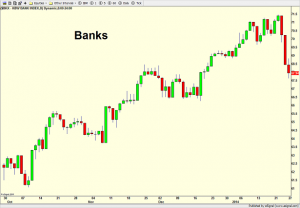 As a bull, it would be very positive to see the banks exceed the level last seen at the end of 2014, roughly 5% higher. Semiconductors are below and happily sitting at fresh 14 year highs. They are a vital sector because so much technology starts with a semi chip. As go the semis, so goes tech. And as goes tech, so goes the rest of the market. 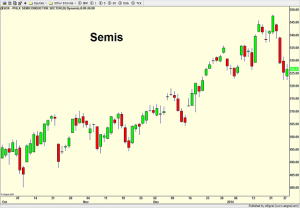 As I mentioned in my 2015 Fearless Forecast, I believe semis finally see all-time highs this year, exceeding the Dotcom bubble peak from 2000. 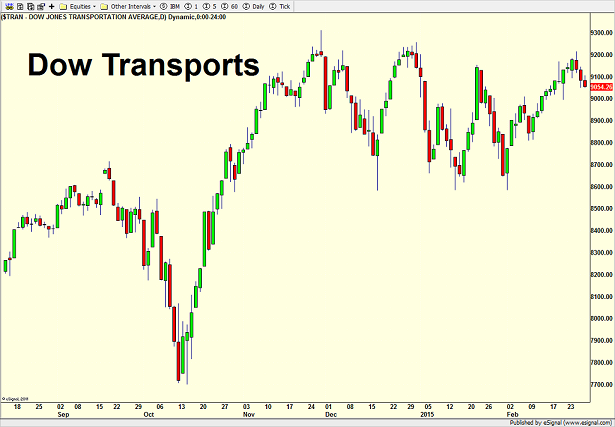 The transports are next and can be viewed both positively and negatively depending on your bias. They are entering their fourth month in a trading range with lower band much more defined than the upper. I downgraded them to neutral in early December (and sold them) when they stopped rallying as crude oil collapsed. That shouldn’t have happened in a strongly bullish scenario. While they still look a bit sloppy, given my more long-term positive outlook, I expect them to resolve the trading range to the upside in a big way by summer. For now, you would have to rate their divergence or inability to keep pace with the Dow Industrials above as a small negative. My two favorite canaries are next. The first one is the cumulative New York Stock Exchange Advance/Decline line, which is just a fancy name for keeping track of the numbers of stocks going up and down on a daily basis and put on a chart. Using words like “always” and “never” are not prudent in this business, but the NYSE AD line is as close to a “never” as it gets. The stock market almost never tops out with this indicator at or near all-time highs as it is today. Before a bear market begins, we usually see this indicator peak 3-20 months before the major stock market indices, which signals that fewer and fewer stocks are participating in the rally. Finally, you can see a chart of the PIMCO High Yield Fund, which for full disclosure we own in two strategies. 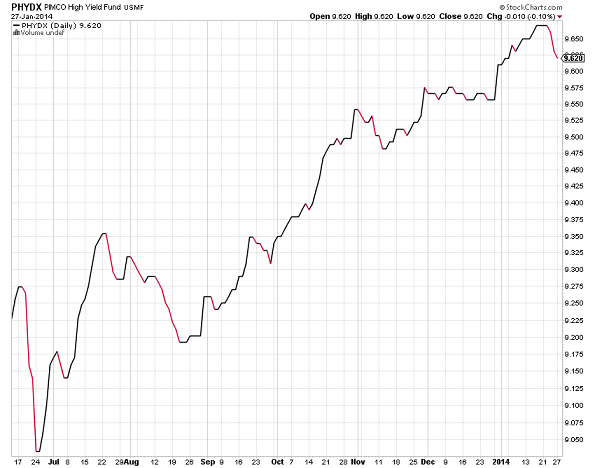 I use this a proxy for the junk bond market along with the exchange traded fund JNK. Junk bonds are among the lowest credit quality in the fixed income space and are acutely sensitive to ripples in the financial system’s liquidity stream as well as the economy. They are the ultimate canary in the coal mine. As the economy very slowly and slightly begins to weaken, investors start to worry about these companies defaulting, long before the GDP numbers roll into recession. While high yields bonds may give too many early warnings, they typically don’t miss the big one. 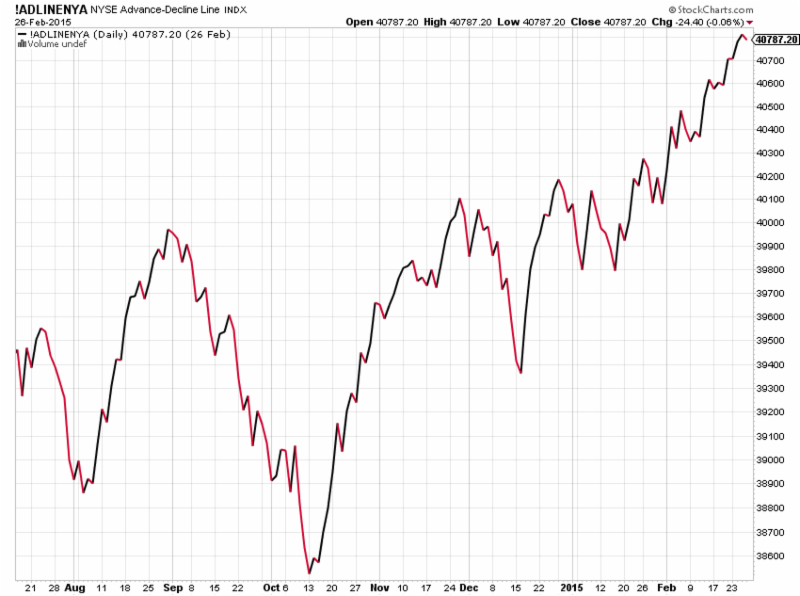 Overall, the sector canaries are neutral to slightly positive, but the NYSE AD Line and high yield sector are strong. The likelihood of a bear market from here is very small. With stocks scoring new highs lately, it’s a good time to pay a visit to the canaries in the coal mine and see if we have any dead ones. For newer readers, Canaries in the Coal Mine is a semi-regular piece when stocks are near fresh highs or lows to signal a potential major trend change or warning sign. This analysis is not good at identifying routine and regular corrections or intermediate-term rallies. 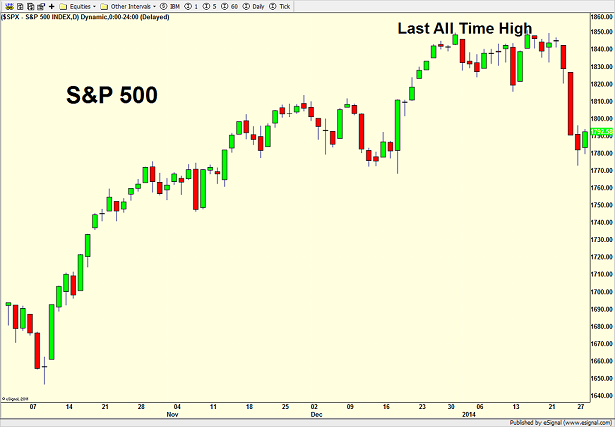 Almost the exact same comments can be made regarding the S&P 500 which is also sitting at an all-time high. Hard to argue with that! 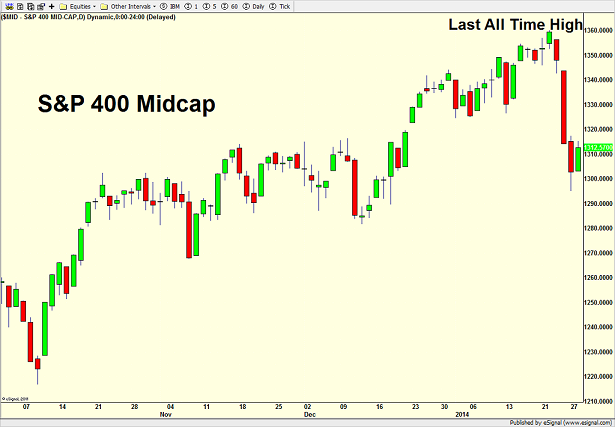 The S&P 400 mid cap index is below and like the previous ones, it sits at yet another all-time high. Do you smell a trend developing here??? 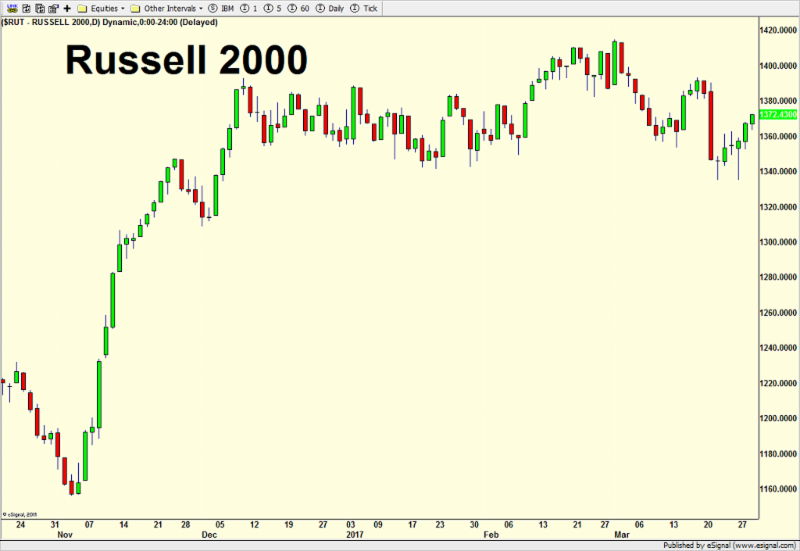 Just like with the others, but even more impressive, the Russell 2000 small cap index is next and sitting at all-time highs. This is probably the biggest “stick in the eye” to the bears because they were hanging their hats on the fact that the small caps performed so horribly last year, which would portend problems for the rest of the market in 2015. That scenario, which I totally discounted in my 2015 Fearless Forecast, was not to be had and the bears will have to find fault somewhere else. 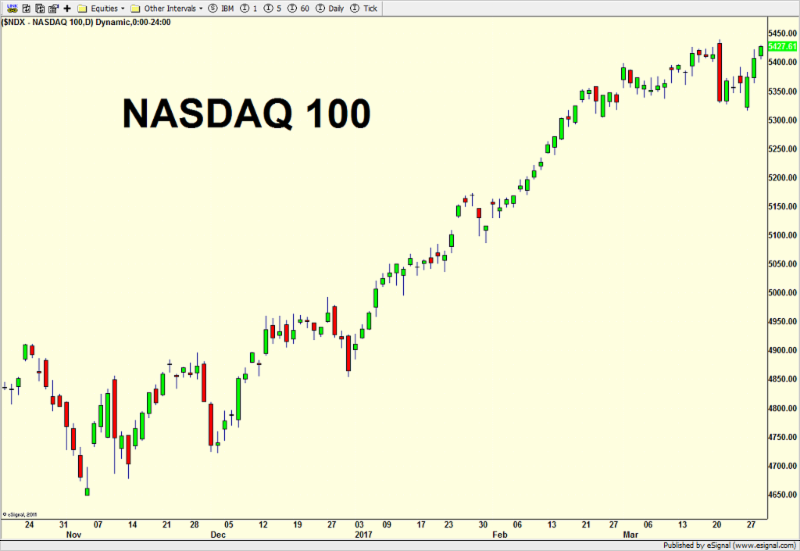 Finally, the NASDAQ 100 is below and while it is not YET at the all-time level last seen in March 2000 which I forecast it will in the 2015 Fearless Forecast, it is, nonetheless, at fresh highs 14 year highs and still a bullish sign. The takeaway from this section is that all canaries are happily signing loudly from a long-term perspective. We can and should see pullbacks and corrections along the way, but those should lead to more all-time highs down the road. Thanks to my friend and business colleague/partner Dave Moenning (stateofthemarkets.com) for the canary pic. It’s been a while since I last updated this column, but it’s not because I am lazy! There simply haven’t been enough changes in the data to warrant an update. 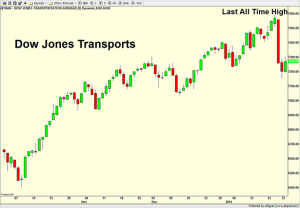 The rally through year-end was very powerful and almost all areas we in gear to the upside. And even today, while there may be a few warnings, we don’t have bull market ending conditions in place. That potential climate seems to be months, if not quarters, or more away. Let’s start with the indices and the Dow. All was well right into year-end and then something began to go wrong in a small way. 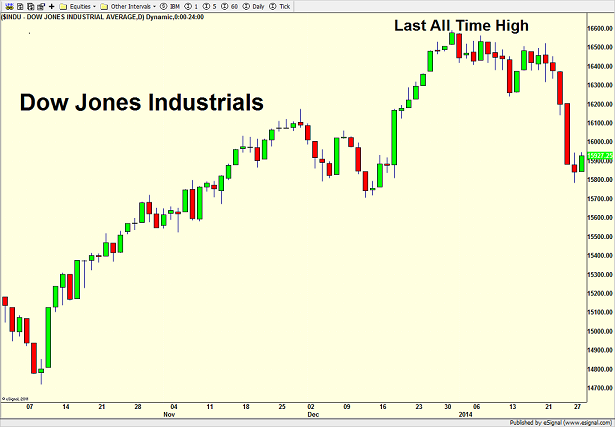 The Dow has now given back all of the gains achieved since the last Fed meeting in mid December. 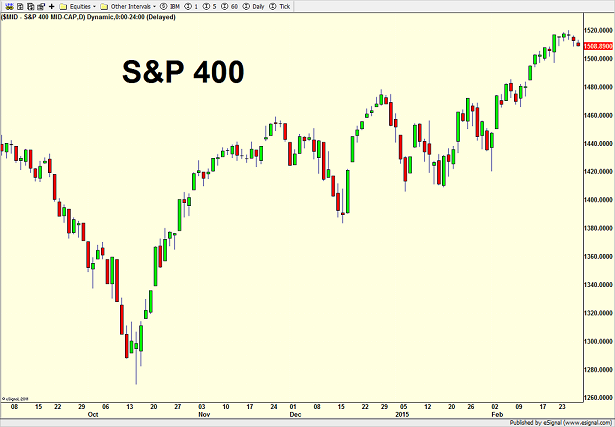 The S&P 500 is next and you can see it was a touch stronger than the Dow to begin 2014. 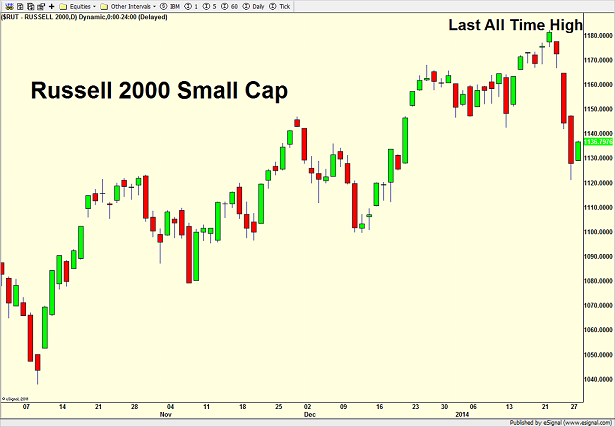 Turning to the S&P 400 Mid Cap below, a very different picture emerges as all time highs were seen last week. 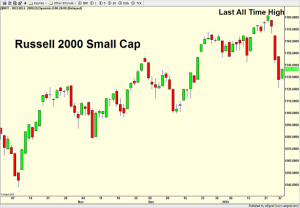 Next is the Russell 2000 Small Cap and just like the S&P 400 above, this index hit all time highs last week unlike the Dow and S&P 500. Finally, the Nasdaq 100 is below and it looks very similar to the previous two indices except that it’s all time still remains from the Dotcom Bubble in March 2000. 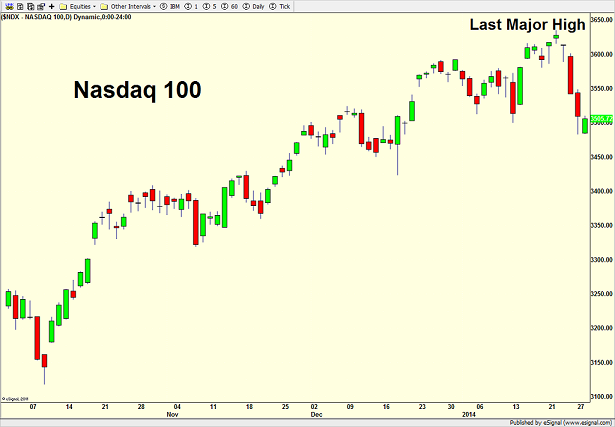 Looking at all of the major indices, we have two small warning signs from the large cap space. 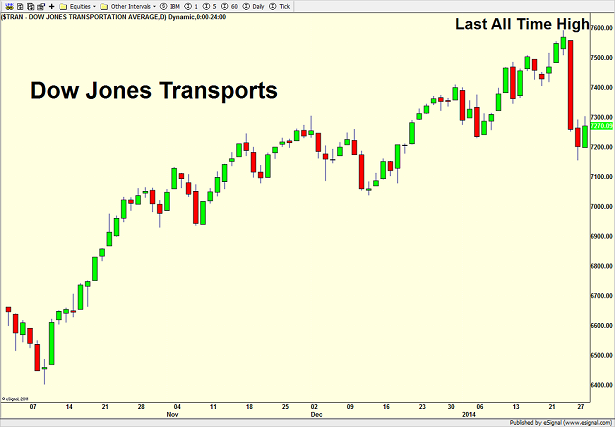 Moving to the key stock market sectors, we can see the Dow Jones Transports and its recent all time high last week. 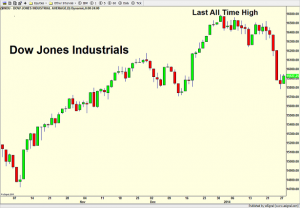 On the surface, that is very good action, but traditional Dow Theory would call a non-confirmation or divergence since the Dow Jones Industrials did not also see all time highs. While this can easily be corrected on a subsequent rally, it is nonetheless a warning sign now. 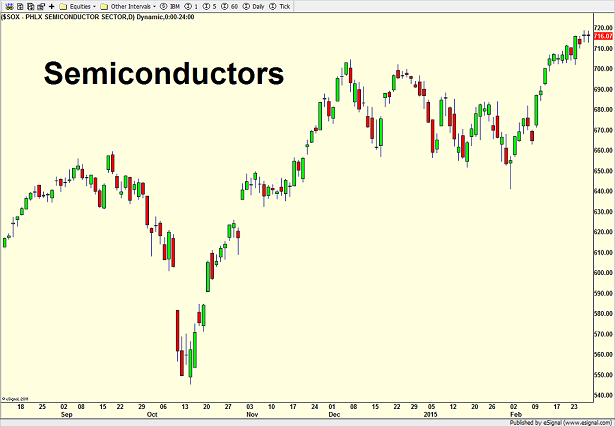 The semiconductors are below and they look very similar to most of the other charts with the last major high seen last week. This group is so crucial to the health of a bull market because historically, as go the semis so goes technology. And as goes tech so goes the market. 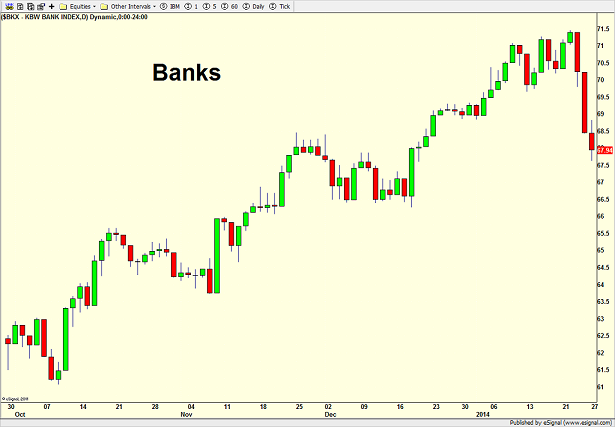 Banks are last in the sector space and they have really kicked it into high gear since the October bottom. It’s hard to argue with their leadership or that of the semis. Another way to graphically see the underlying strength in the stock market is through the New York Stock Exchange Cumulative Advance/Decline Line which simply tallies the number the stocks going up and down on a given day and adds them to the previous day’s total. 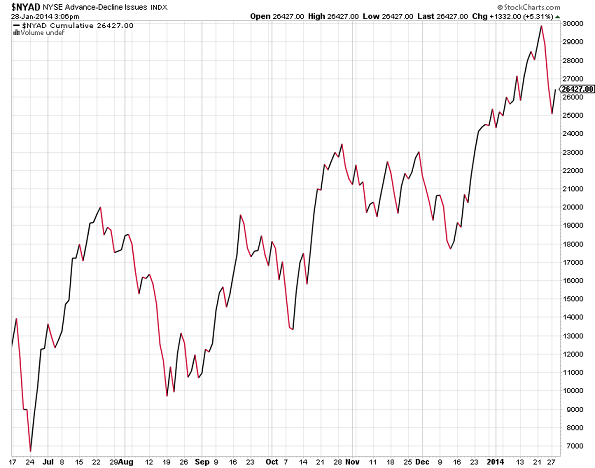 As you can see below, the NYSE A/D Line just recently made another all time high, which is not something we typically see at major market peaks. Lastly, let’s turn to the high yield (junk) bond sector, which is one of the primary canaries we watch. Junk bonds are among the riskiest and most volatile in the fixed income area and are definitely among the most sensitive to ripples in the liquidity stream. After being left for dead during the second quarter of 2013, they did a complete 180 and slowly and steadily marched back to all time highs, surprising many people, including me! 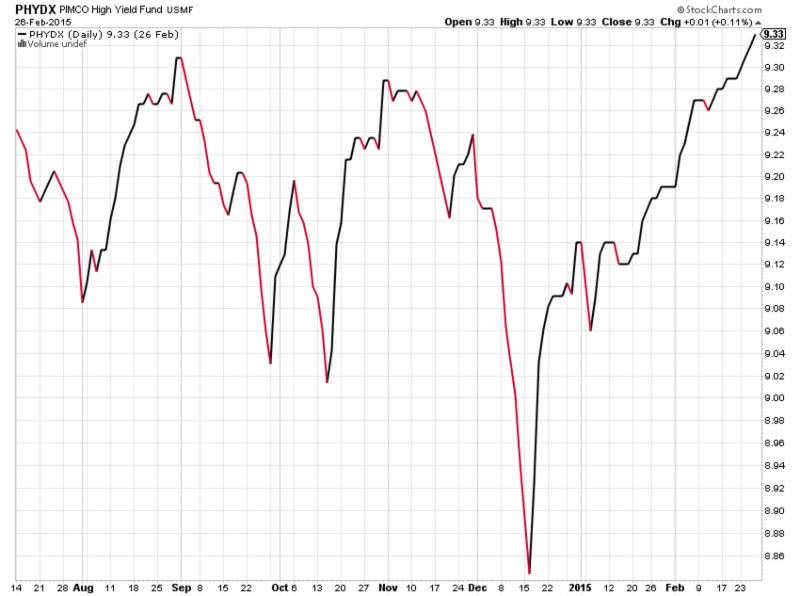 It’s going to take another mini cycle before high yield warns again. Summing it all up, the bull market is old, but alive and basically well. 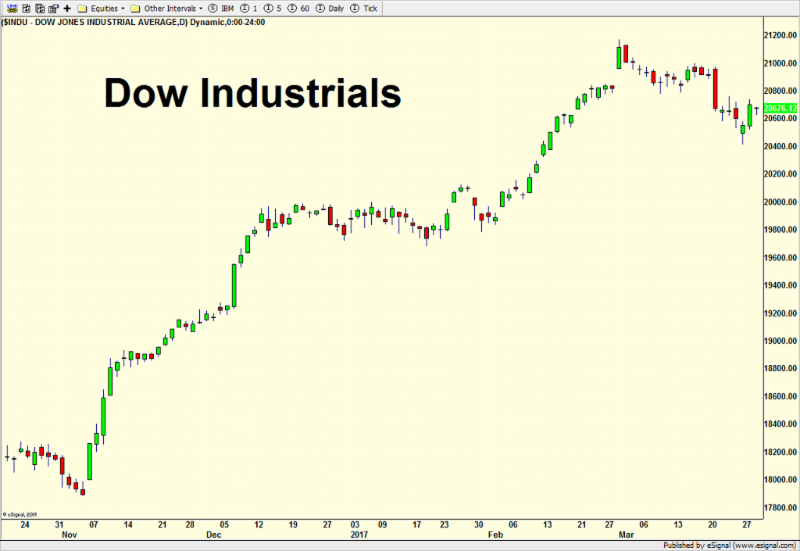 We have a few yellow lights from the Dow Jones Industrials lagging, but that can and may be corrected during the first few months of 2014.